Just a reminder that due to the end of Daylight Saving Time, the Phillippi Harbor Marina will close one hour earlier beginning on Sunday, November 4, 2018. The scheduled return time for all boats at that location will be 4:00 p.m.instead of 5:00 p.m. (Due to computer software limitations your reservation and reminder emails will still display as 5:00 p.m. as a scheduled return time). Please note this action is under strict rule by the marina and will stay in place until Sunday March 10, 2019. Wednesday, February 6th: Sunset Cruise – Phillippi Harbor Location 4:45 p.m. - After sunset, $20/per person (plus tax). Bring your friends & family, as well as beverages and snacks. We will be providing captains and watching the sunset at Big Pass. This is a very relaxing, fun event and a great way to meet some fellow members! Tuesday, February 19th: Venice Full Moon Cruise – Venice location 6:00 p.m. - 8:00 p.m., $25/per person (plus tax). Bring your friends & family, for a relaxing evening watching the full moon rise over north Lemon Bay. Bring your own beverages and snacks, as always, dress for the weather. Wednesday, February 27th: Sunset Cruise – Phillippi Harbor Location 4:45 p.m. - After sunset, $20/per person (plus tax). Bring your friends & family, as well as beverages and snacks. We will be providing captains and watching the sunset at Big Pass. This is a very relaxing, fun event and a great way to meet some fellow members! Wednesday, March 6th: Sunset Cruise – Phillippi Harbor Location 5:30 p.m. - After sunset, $20/per person (plus tax). Bring your friends & family, as well as beverages and snacks. We will be providing captains and watching the sunset at Big Pass. This is a very relaxing, fun event and a great way to meet some fellow members! Wednesday, March 13th: Sunset Cruise – Cortez Location 6:30 p.m. – After sunset, $20/per person (plus tax). Bring your friends & family, as well as beverages and snacks. We will be watching the sunset at Longboat Pass. This is a very relaxing, fun event and a great way to meet some fellow members! Wednesday, April 3nd: Sunset Cruise – Phillippi Harbor Location 6:30 p.m. - After sunset, $20/per person (plus tax). Bring your friends & family, as well as Beverages and snacks. We will be providing captains and watching the sunset at Big Pass. This is a very relaxing, fun event and a great way to meet some fellow members! Wednesday, April 10th: Sunset Cruise – Cortez Location 6:45 p.m. – After sunset, $20/per person (plus tax). Bring your friends & family, as well as beverages and snacks. We will be watching the sunset at Longboat Pass. This is a very relaxing, fun event and a great way to meet some fellow members! Interested in Paddleboard tours, rentals or Paddleboard Yoga? • Captain Doug does private excursions too! Give us a call at the office and we will set you up for a morning, all day, afternoon, or evening cruise with Captain Doug only $25 per boat per hour plus gas! Contact (941) 795-1600 or Email doug@wavesboatclub.com to sign up! Good news boaters starting Thursday , November 1, 2018 through Tuesday, April 30, 2019 all five Waves locations will be open 7 days a week!!! To make a reservation for a day when a location is normally closed, call the reservation office at 941-795-1600. Click here for more information! Thursday , November 1, 2018 through Tuesday, April 30, 2019 all five Waves locations will be open 7 days a week!!! To make a reservation for a day when a location is normally closed, call the reservation office at 941-795-1600. Office hours are Monday through Friday from 9:00 a.m. - 3:00 p.m. and 8:30 a.m. - 3:00 p.m. on Saturday & Sunday, or leave a detailed voice message when calling outside these hours. The seasonal social events are out and we have some exciting events in store! Click here to see a list of social events for November 2018 through January 2019 or check out the event calendar under the members tab! Wednesday, November 7th: Sunset Cruise – Phillippi Harbor Location 5:00 p.m. - After sunset, $20/per person (plus tax). Bring your friends & family, as well as beverages and snacks. We will be providing captains and watching the sunset at Big Pass. This is a very relaxing, fun event and a great way to meet some fellow members! Saturday, November 17th: Leonid Meteor Shower Cruise – Venice Location 8:00 p.m. - 10:00 p.m., $25/per person (plus tax). The Leonid Meteor Shower occurs when the earth passes through debris left by the comet Temple-Tuttle. You can see about twenty meteors an hour when the meteor shower reaches its peak activity. We will cruise down into north Lemon Bay where there is very little surrounding light to dim the view. Bring your own beverages and snacks and dress according to weather. Wednesday, November 21st: Sunset Cruise – Cortez Location 4:45 p.m. - After sunset, $20/per person (plus tax). Bring your friends & family, as well as beverages and snacks. We will be providing captains and watching the sunset at Longboat Key. This is a very relaxing, fun event and a great way to meet some fellow members! Saturday, December 1st: Venice Boat Parade – Venice Location 5:00 p.m. - 8:00 p.m., $25/per person (plus tax). Bring your friends & family for a relaxing evening watching the Venice Boat Parade! As usual you are welcome to bring your own beverages and snacks. We will be providing captains and watching the parade (Waves is not a participant in this event). This is a very relaxing, fun event and a great way to meet some fellow members! Sunday, December 2nd: 14th Annual Member Appreciation Beach Picnic – Turtle Beach Pavilion 11:00 a.m. - 1:00 p.m., FREE. It's that time of year again "come one, come all" to Waves Boat and Social Club's 14th Annual Member Appreciation Beach Picnic! This is our signature event of the year just to thank our wonderful members! We welcome you to bring family, friends, & prospective members. The event will be held at the Turtle Beach Pavilion at Turtle Beach and will have music, games, potluck & prizes! You must RSVP with the reservation office before attending. Wednesday, December 5th: Sunset Cruise – Phillippi Harbor Location 4:45 p.m. - After sunset, $20/per person (plus tax). Bring your friends & family, as well as beverages and snacks. We will be providing captains and watching the sunset at Big Pass. This is a very relaxing, fun event and a great way to meet some fellow members! Wednesday, December 19th: Sunset Cruise – Phillippi Harbor Location 4:45 p.m. - After sunset, $20/per person (plus tax). Bring your friends & family, as well as Beverages and snacks. We will be providing captains and watching the sunset at Big Pass. This is a very relaxing, fun event and a great way to meet some fellow members! Wednesday, January 2nd: Sunset Cruise – Phillippi Harbor Location 5:00 p.m. - After sunset, $20/per person (plus tax). Bring your friends & family, as well as Beverages and snacks. We will be providing captains and watching the sunset at Big Pass. This is a very relaxing, fun event and a great way to meet some fellow members! Wednesday, January 16th: Sunset Cruise – Phillippi Harbor Location 5:00 p.m. - After sunset, $20/per person (plus tax). Bring your friends & family, as well as Beverages and snacks. We will be providing captains and watching the sunset at Big Pass. This is a very relaxing, fun event and a great way to meet some fellow members! Monday, January 21st: Full Moon Cruise – Cortez location 5:30 p.m. - 8:00 p.m., $25/per person (plus tax). Bring your friends & family, for a relaxing evening watching the full moon rise over Sarasota bay and downtown. Bring your own beverages and snacks, as always, dress for the weather. Good news for local boaters as the red tide bloom slowly disappears due to hurricane and cooler weather! New Fishing Charter Partnered with Waves Boat Club! Waves Boat & Social Club is pleased to announce that we have partnered with yet another Fishing Charter in Sarasota Florida! Drag-on Charters will help you get your inshore or offshore "Fish on with Drag-on!" Click here for more info! Waves Boat & Social Club is pleased to announce that we have partnered with another Fishing Charter in Sarasota Florida! Come along with Capt. Eric Paquin for a fun and adventurous time catching big game fish. Whether its inshore for Snook and Reds or offshore for Grouper and Snapper, he can assure you a safe and effective day on the water! 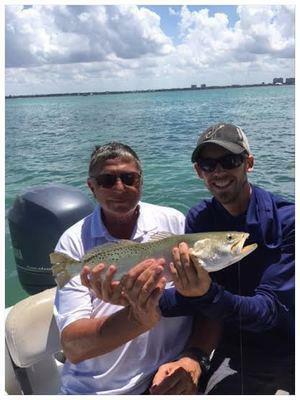 Drag-on Charters has been fishing the waters in the Sarasota area over 15 years, leaving hundreds of very satisfied customers raving about their personal experiences with Drag-on Charters. Call today to book a fishing charter now for an upcoming birthday, anniversary or any occasion at a special WAVES Rate! Click here to view the upcoming social events for September - October 2018! Wednesday, September 19th: Sunset Cruise – Phillippi Harbor Location 6:30 p.m. – After sunset, $20/per person (plus tax). Bring your friends & family, as well as Beverages and snacks. We will be providing captains and watching the sunset at Big Pass. This is a very relaxing, fun event and a great way to meet some fellow members! Monday September 24th: Full Moon Cruise – Cortez location 7:00 p.m. – 9:00 p.m. $25/per person (plus tax). Bring your friends & family, for a relaxing evening watching the full moon rise over Sarasota bay and downtown. Bring your own beverages and snacks. As always, dress for the weather. Wednesday, October 3rd: Sunset Cruise – Phillippi Harbor Location 6:30 p.m. – After sunset, $20/per person (plus tax). Bring your friends & family, as well as beverages and snacks. We will be providing captains and watching the sunset at Big Pass. This is a very relaxing, fun event and a great way to meet some fellow members! Wednesday, October 24th: Venice Full Moon Cruise – Venice location 6:30 p.m. – 9:00 p.m. $25/per person (plus tax). Bring your friends & family, for a relaxing evening watching the full moon rise over north Lemon bay. Bring your own beverages and snacks. As always, dress for the weather. Red tide is mild at the moment in Charlotte County as well as most of Sarasota & Bradenton with a few spots of high debris in some areas. Keep updated with the red tide report in our Blog tab on the Waves Boat & Social Club home page. A shift in wind is bringing the Red Tide back into the intra-coastal once again, but our clean up crews are on the move! Stay posted to our updates at the Waves Boat & Social Club Blog Page. Brand New Boat at Phillippi Harbor Club! Help us welcome #62 SIESTA FIESTA to our Waves Boat & Social Club fleet. This Hurricane deck boat is 23.5' with a new 150' 4X Yamaha . She is water sports approved and holds up to 10 people! Give her a try today! Happy to inform that the red tide is clearing out and the weather temps are dropping as well! Check out the Blog tab to learn more! Be Safe, Check Weather Conditions & Tides Before You Boat! Always Remember Safety 1st Fun 2nd! Make sure to check the weather conditions and tides before your excursions this summer. Thunderstorms and lightening are recurring this time of year. Click here for more! Wednesday, July 11th: Sunset Cruise–Phillippi Harbor Location. 7:15 p.m. – After sunset (8:28 p.m.), $20/per person (plus tax). Bring your friends & family, as well as Beverages and snacks. We will be providing captains and watching the sunset at Big Pass. This is a very relaxing, fun event and a great way to meet some fellow members! Wednesday, July 25th: Sunset Cruise–Phillippi Harbor Location. 7:00 p.m. – After sunset (8:18 p.m.), $20/per person (plus tax). Bring your friends & family, as well as Beverages and snacks. We will be providing captains and watching the sunset at Big Pass. This is a very relaxing, fun event and a great way to meet some fellow members! Wednesday, August 8th: Sunset Cruise–Phillippi Harbor Location. 6:45 p.m. – After sunset (8:03 p.m.), $20/per person (plus tax). Bring your friends & family, as well as Beverages and snacks. We will be providing captains and watching the sunset at Big Pass. This is a very relaxing, fun event and a great way to meet some fellow members! Wednesday, August 22nd: Sunset Cruise–Phillippi Harbor Location. 6:30 p.m. – After sunset (7:43 p.m.), $20/per person (plus tax). Bring your friends & family, as well as Beverages and snacks. We will be providing captains and watching the sunset at Big Pass. This is a very relaxing, fun event and a great way to meet some fellow members! *Note: The Cortez location (The Seafood Shack Marina) will have half of the fleet open on Mondays until November 1, 2018. Please call (941) 795-1600 to schedule reservations for mondays in Bradenton. Did you know you can set up your very own social event? As a member of Waves Boat and Social Club you have the opportunity to reserve your very own charter with Captain Doug! Charters can depart from 4 of our 5 locations: Stump Pass, Venice Marker 4, Phillippi Harbor Club, and Cortez Seafood Shack Marina of Bradenton. Private Charters are good for bachelor or bachelorette parties, family get togethers, a romantic dinner on the water, or just to take out some co-workers, you call us and let us know! Have a Great Boating Day! Come along with Captain Casey, one of our very own WAVES Dockmasters, for an inshore fishing clinic! Click here for more Details. Like fishing, but don't know any of the good spots or tricks? Come along with Captain Casey Maloney for an inshore fishing clinic. Capt. Casey is a proud USCG approved captain who was born and raised right here in Sarasota, Florida. Captain Casey has been on the water since before he can remember and is a fantastic, fun, and knowledgeable dock master (Sarasota locations) here at WAVES. "Exploring these clear blue waters have always been a way of life for me"
Maloney has a passion for sharing the beauty of Sarasota Bay with others and enjoys the exciting & helpful excursions he has to offer, so come with him on an unforgettable trip into paradise. The clinics will be focused on proper equipment, correct rigging of your pole, different baits and techniques for catching a variety of saltwater species. Book one of the terrific fishing boats Waves has to offer, and contact me for availability. (Stickney Point or Phillippi Creek are the preferred locations). Please set an early departure time (8:00 a.m.-9:30 a.m.). Bring along any saltwater fishing gear you have plus 4 dozen live shrimp from a local bait shop. If you don't have gear, Captain Casey will provide everything you will need for the day. The day will be spent fishing at some great spots and learning how to consistently catch more fish. I'm looking forward to seeing you out on the water. Rep. Your Favorite Boat Club, WAVES Shirts Available! Order your long sleeved dry fit shirt today! Call (941) 923-1616 for more information.